My son, Shaeffer, took a two year old class well when he was 2! His teacher was Miss Nadi and she was amazing in every way possible. She was happy and sweet and creative and she sang adorable songs with the kids. She even recorded herself singing the songs so the kids could listen at home. This still is one of his favorite CD’s and he’s now 5! Well every year she would ask a few parents to make a batch of play dough for her classroom. This play dough would last her all year! It’s soft and creamy and wonderful! Stir together in a big bowl, 4 cups of flour, 2 cups of salt, and one container of cream of tarter (I used 2.5 ounces). In a large pot combine 9 tablespoons vegetable oil, 4.75 cups hot tap water and food coloring. Add the dry ingredients to this pan and cook over medium heat, stirring constantly for about 5 minutes. It looks like a mess, but it will thicken and get lumpy and eventually form into a ball. Turn the dough ball out of pan on to a lightly floured surface and knead until smooth and combine. Put the dough in a bag while it is still warm and check later for consistency. *** When you first put the dough in the pan, try to break up the lumps with the spoon. Later, when it is getting close to being done, lumps will form and all the goo will come together and form into a ball. 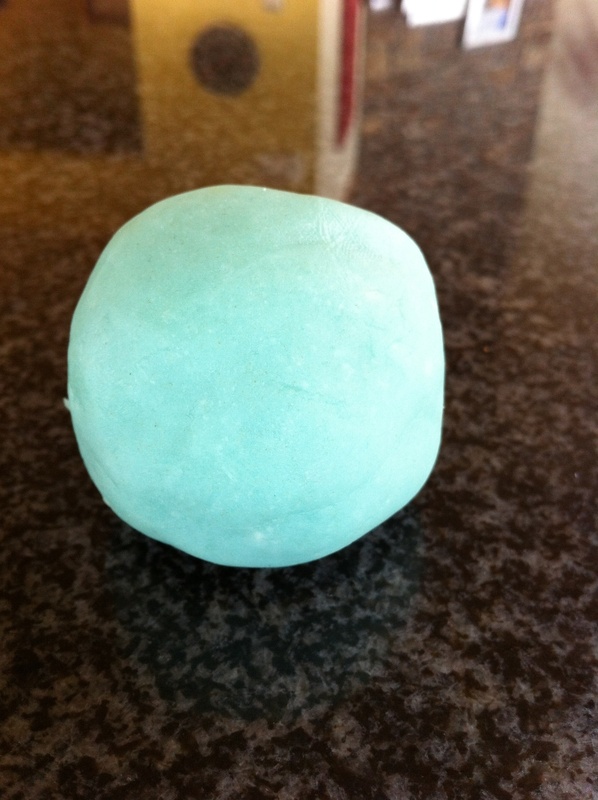 When the play dough is done it should be very soft and easily squish through your fingers. If it’s too dry just add extra hot water (which I did not have to do).